Discovering that Paul McDonough is having a show @ Sasha Wolf (in NYC, opens Sept. 20th) provided one of those web zingers in which worlds I’d never considered together suddenly slam into each other and form a new whole. Big Bang! 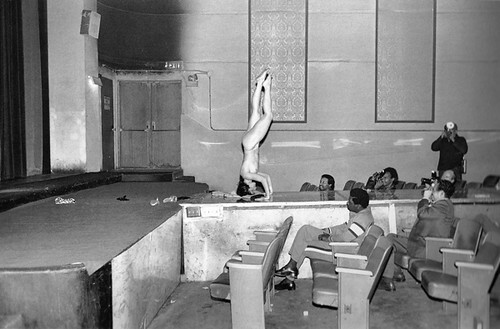 In the mid-eighties, Paul McDonough was photographing at Ivar’s Theater in Los Angeles, as was Garry Winogrand. Perhaps they were pals. Ivar’s has a storied history, was renovated a few years ago, and now houses a Children’s Theater. 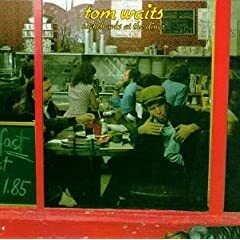 Tom Waits frequented Ivar’s too, in the 70’s, and it crept into a song (two, actually) on “Nighthawks at the Diner“. Here’s Waits, who recorded “Emotional Weather Report” eight years before the photographers showed-up, followed by McDonough’s shot and Winogrand’s. And a 2point8 reader just sent in this one, in which Winogrand Bill Dane makes an appearance in the background. Update: And London pal Matt Stuart sent this, from page 53 in “The Man in the Crowd, The Uneasy Streets of Garry Winogrand”, a photo of Tod Papageorge helping a lady across the street, with Paul McDonough on the right. Strangest thing is that I never noticed the flyer for PANTOMIME on the far right, which anchors that side of the picture, indeed. Thanks to the Tom Waits Library for the Waits/Ivar’s connection, though their plug-in audio didn’t work for me, so I hooked-up my own. Thanks for the info on that show. I had heard Winogrand mention McDonough before, but never have seen any of his work. 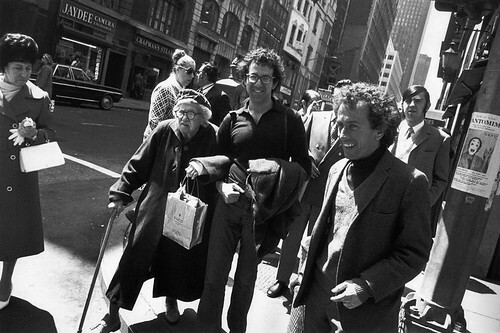 More trivia…I believe that is photographer Bill Dane pictured in the Winogrand photo. Visiting your blog is allways a treat. Thanx again for the special information you provide. It’s priceless!! Nope, that’s definitely Tod and Paul in the photograph. I caught the show at Sasha Wolf and it was gorgeous–and packed! This was actually the opening show for the gallery and a real treat for those of us interested in street photography. Winograd’s wife, Adrienne Judith Lubeau, was there and was full of insights into Winograd’s life and work, in addition to McDonough’s. I am sure that she could settle any questions about Winograd’s relationship with Paul McDonough, if any remain. Apparently, the gallery is going to focus on a number of photographers who work in the documentary tradition. Paul McDonough and Tod Papageorge actually grew up on the same block in Brooklyn and were good childhood friends. I forgot if that is when they both befriended Winogrand or of it was later on after Winogrand got into photography. But eventually from the 60’s on, they were all definitely friends. A little late but I just came across this post. That is actually Bill Dane in the Winogrand photo standing up in the Ivar shooting with the Leica and a Vivitar 285 flash. There are two of Dane’s photos where Winogrand makes an appearance, the one show (a print of which I have the pleasure of owning) and another which is a close-up of a woman in mid-contortion.